In this experiment, my partner and I choose Hydrophobic and Aromatic amino acids to test the efficiency of producing gold nanoparticle. To prepare the solutions, we followed the steps of making the gold solution of the previous experiments. Therefore, 4mL of the 100mL gold solution of 1.18mM should be used. 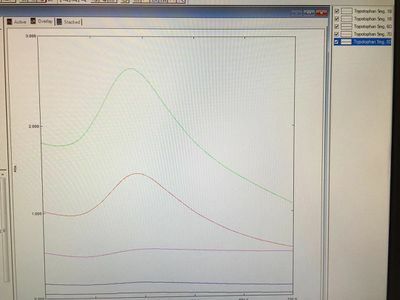 In this process of making the gold solution, we made an error, measuring about 0.427g instead of 0.0408g, and the new concentration of the gold solution is 1.257mM. Additionally, 1mg of each amino acid is mixed with 3.6mL Distilled water (DI water) and added to the gold solution. 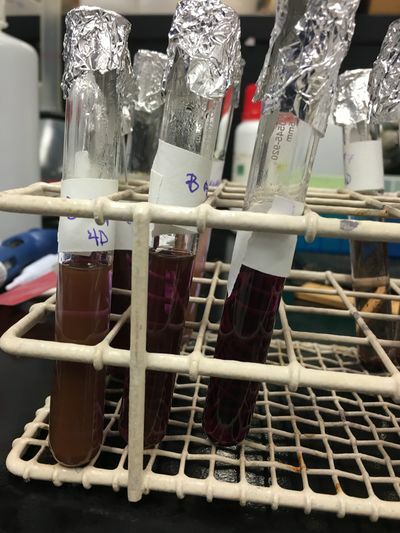 To determine if the acidic or basic solution will be more beneficial to the production of the gold nanoparticle, we also added a certain amount of HCl or NaOH to the solutions (Acidic: 0.4mL (1M HCl) and Basic: 0.004mL NaOH (5mM)). After preparing all the solutions, we put them in the oven and set the oven to 80 Celcius degrees, heating for 4 hours. Note: When we transferred amino acid and HAuCl4 into the test tubes, we used the P1000 pipette to get 1mL DI water moved to the weight boat, which can make sure that most of the substances get transferred. For the second time, we had another 1mL added to the weight boat to get the remaining substances moved into the test tubes. As we observed, most basic solutions had color changes. In the acidic solutions, Tryptophan is the only one that can perform the color change. Therefore, we assumed that basic stock solutions might produce more gold nanoparticle. There is a problem in the process of measuring HAuCl4. Although the spatula is covered with parafilm, solid HAuCl4 become the liquid. As the spatula is dried with the paper towel, there might be another reason for this phenomena - gold chloride might be contaminated. After taking all the solutions out of the oven, as we observed, most gold particles in the test tubes were crashed out. Therefore, we assumed that the oven's temperature was too high or the heating time was too long. For the next time, we need to adjust the temperature and heating time or put the stock solutions in the water bath. 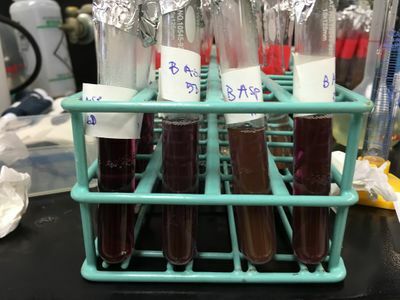 Additionally, we can also adjust different ratios of amino acids and gold chloride and values of pH of stock solutions to see if more gold nanoparticle can be produced. In the acidic solutions, Tryptophan is the one that shows the best result. In the basic solutions, Phenylalanine, Tryptophan, and Tyrosine can work better. From these solutions, Aspartic Acid shows the best result as the color change is obvious. 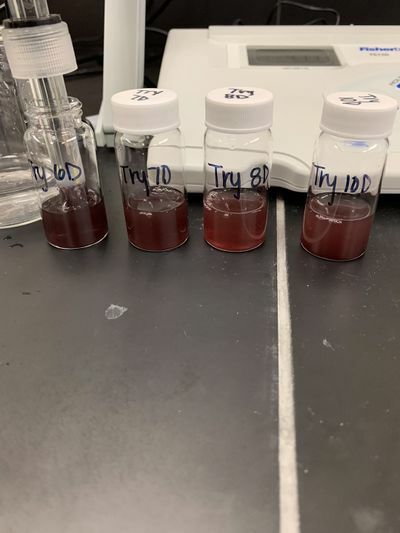 From the last two experiment, Tryptophan and Aspartic Acid are the ones that can produce gold nanoparticles efficiently. 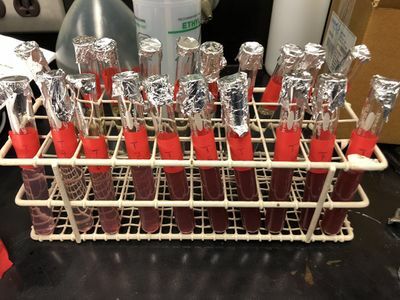 These solutions are the same as the first experiment's solutions - most of the gold nanoparticles are crashed out, which means that the heating method should be adjusted. Therefore, my partner and I decided to put the new made solutions in the water bath to heat to see if there is any change presented. 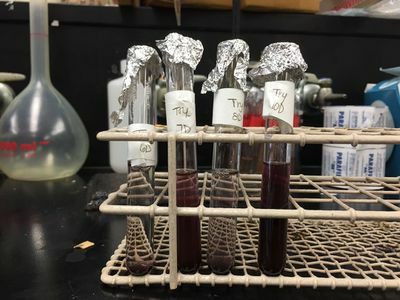 For this time, we change the ratios of amino acids and gold chloride to determine which ratio can work efficiently in the production of gold nanoparticles. 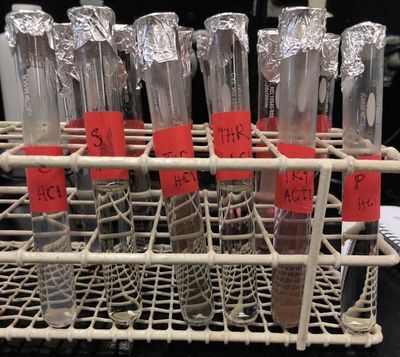 From the last two experiments, we have determined that Aspartic Acid and Tryptophan are the amino acids that can perform the color change with the gold chloride in the basic environment. Therefore, for today's experiment, we will use different ratios of the gold chloride and amino acids to determine which ratio can be the most productive. In the process, we have 10 samples for each amino acid and add the corresponding number mg of the gold chloride to test tubes. The concentration that is used is still 5mM and volume of the base is 0.004. After finishing preparing all the stock solutions, Tryptophan's purple color change is extremely dark and Aspartic Acid's yellow color change is very light. As we have known that 80 Celcius degrees and 4 hours will make the gold nanoparticles crashed out, which implies that these nanoparticles have transferred to the fibers. Therefore, for the Aspartic Acid solutions, we used the water bath to get them heated. However, we don't know whether the Tryptophan solutions will be affected by the oven's settings or not. Consequently, we used the oven to heat Tryptophan solutions. 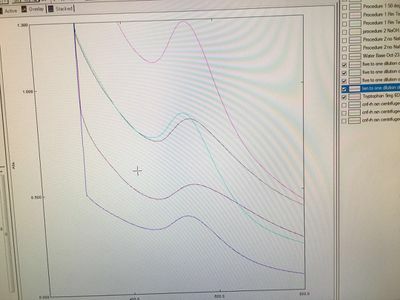 To determine which ratio can be the most productive, for the next experiment, we will use the UV monochromator to detect the intensities of gold solutions to decide which solution can be the most concentration so that we can focus on another factor that might affect the efficiency of producing gold nanoparticles. For today's experiment, we used UV monochromator to detect the intensity by observing the absorbance of the solutions to decide which ratio of gold chloride and amino acids can be more productive. Today, we used UV monochromator to determine the intensity of gold nanoparticles in the test tubes. 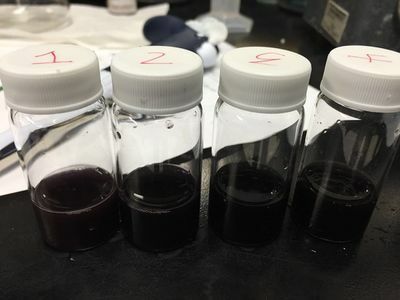 As we observed, in the Aspartic Acid solutions, 1, 2, 3, 5, and 6 solutions have the obvious color changes, which implies that these solutions might have more gold nanoparticles. 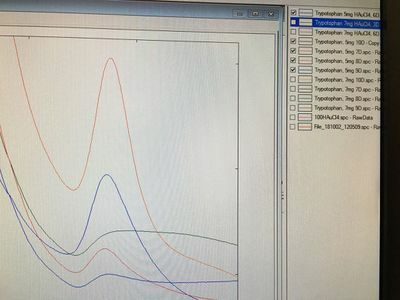 For the Tryptophan solutions, we used UV monochromator to detect all the solutions to determine which ratio can be used effectively by Tryptophan. As the data shows, number 5 Aspartic Acid solution, number 5 Tryptophan solution, and number 7 Tryptophan solution showed the relative high absorbances. 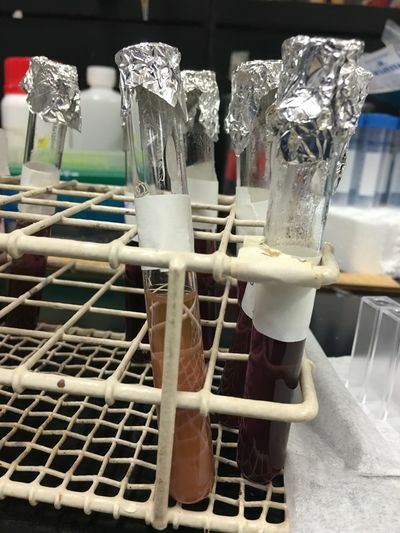 As we have determined what ratios can be effective for these amino acids, we analyzed another factor that can affect the production - the basic environment, which is the factor that we have decided in the previous experiments. However, we also need to determine the pH range that can make amino acids effectively react with gold chloride to produce gold nanoparticles. As we need to change the pH to determine the range, so we need time to do the calculations. Therefore, we will prepare the modified solutions in the next week. As we need 0.004mL of 5mM NaOH solution to be added to the test tubes in the previous experiments, so the number of moles that we need for NaOH solution is 0.00002. Therefore, we want to prepare 1M NaOH solution to get the safety ensured because the high-concentration base solution is dangerous and we don't have to take too much solution, 20μL, to achieve the same effect. As the taken volume of the base solution decreases, so the taken volume of DI water needs to be increased. As we decided, we would take 0.5μL as one drop and want to test the solutions with different numbers of drops, 1-10. For today's experiment, we would take 1-6 drops for Aspartic Acid 5mg, Tryptophan 5mg, and Tryptophan 7mg. Actually, we first wanted to use the titration to adjust the pH, such as 7, 7.5, 8, 8.5, and so on. However, as we analyzed, so we took the way that adding drops of the base solution test tubes. 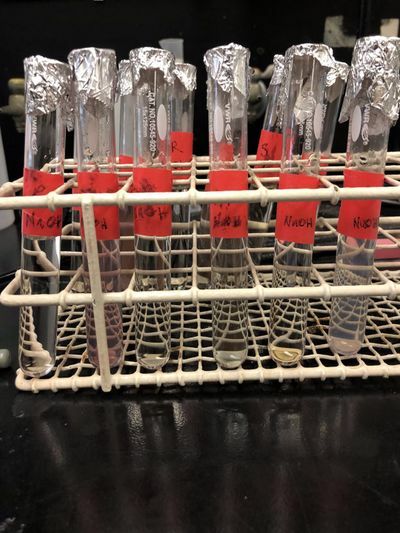 In the process of the experiment, we got the Arginine amino acids and made the stock solution with the same steps in the first experiment - 4mL of gold chloride solution, 1mg of amino acid, 3.6mL of DI water, and 0.004mL of 5mM NaOH solution. For this experiment, we used the water bath to heat Aspartic Acid solutions to determine the efficiency. 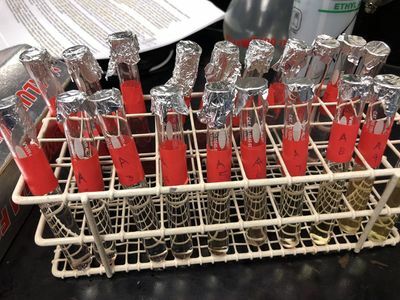 Before putting Tryptophan samples in the oven, all the samples turned purple after adding NaOH to test tubes. 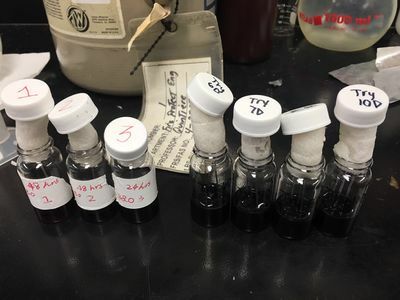 All boiled Aspartic Acid samples except 4, which is cloudy, have dark colors. The reason that number 4 solution of Aspartic Acid is cloudy might be gold nanoparticles got crashed out in the process of heating and became the fibers. After heating in the oven for4 fours, some samples crashed out. In the process of operating UV, we diluted Aspartic Acid 5mg, 6D sample with a 5 to 1 ratio and shows the best result in 1 - 6 drops samples. When testing "Tryptophan 5mg, 6D sample, this one shows the best result in 1 - 6 drops samples. In addition, Tryptophan 7mg, 3D sample shows the best result in 1 - 6 drops samples. 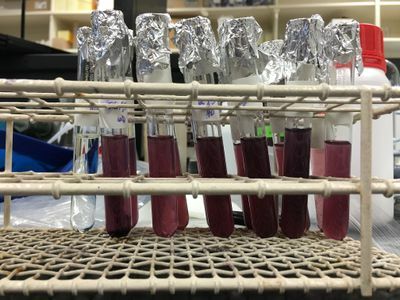 Therefore, for the next experiment, we will prepare other solutions with adding more the base, 7 - 10 drops, to see if more base can be more effective for producing gold nanoparticles. Additionally, we will measure the pH values of samples in the following experiments to see which pH range can be best. 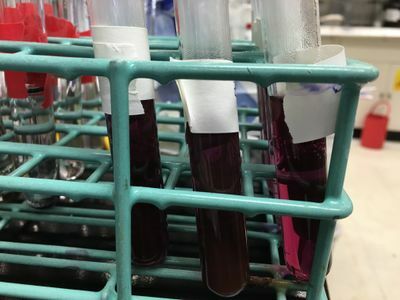 In this experiment, we made new samples - HAuCl4 5mg and 7mg, 7 - 10drops of 1M NaOH to test the new range and the total volume of the solutions should still be kept with 7.6mL so that we could determine the best pH range that can make the solutions produce more gold nanoparticles. HAuCl4 5mg group's samples showed darker color change than HAuCl4 7mg group's samples. Therefore, we assumed that HAuCl4 5mg group would produce more gold nanoparticles. To determine if this hypothesis is true, we need to test these samples' intensities with the UV monochromator to make conclusions. For today's experiment, we used the UV monochromator to test the absorbances of gold samples to determine how many drops of 1M NaOH can create the best basic environment for the production of gold nanoparticles. When testing the samples, we found that Tryptophan 5mg 7D, Tryptophan 5mg 8D, and Tryptophan 7mg 10D samples showed the relative absorbances. Though Tryptophan 7mg 10D showed the highest value of absorbance in this Tryptophan 7mg 7 - 10drops group, this intensity was still low compared with "Tryptophan 5mg" group's samples. As Tryptophan 5mg 10D showed the strange peak in the graph, therefore, we decided to prepare the new samples Tryptophan 5mg 6D, Tryptophan 5mg 7D, Tryptophan 5mg 8D, and Tryptophan 5mg 10D. 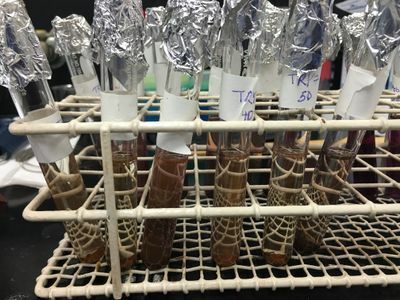 As we analyzed from the previous experiment, "Tryptophan 5mg 1-6D group", "Tryptophan 5mg 6D showed the highest value in this group, which is the reason that we decided to redo the preparation of this sample. After preparing the samples, we had them put in the oven and set the heating temperature at 80 Celsius degrees and the heating time for 3 hours. For the next experiment, we will still use the UV monochromator to determine Tryptophan 5mg 6D, Tryptophan 5mg 7D, and Tryptophan 5mg 8D samples can show some different effects from the previous experiments. From those samples' detect, Tryptophan 5mg 7D sample showed the extreme high absorbance. 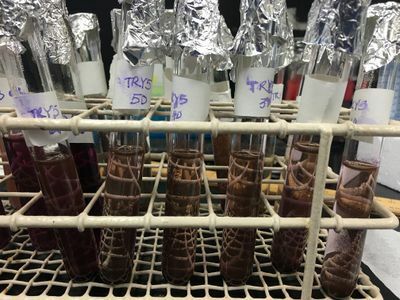 Consequently, we predicted that the pH range around the pH value of Tryptophan 5mg 7D sample can be suitable for the samples to produce gold nanoparticles. For today's experiment, as describes in the last experiment's notes, we tested the samples with the UV monochromator. For this time, Tryptophan 5mg 10D still showed the strange peak, which is extremely different from other samples. 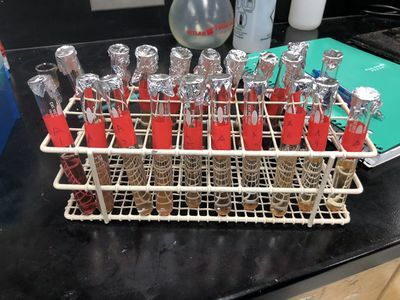 As we asked our instructor, the substances in the test tube have been gold fibers instead of the gold nanoparticles, which could explain why the low intensity of the gold sample appeared. As gold nanoparticles in test tubes crashed out, we prepared another group of samples and chose to use the water bath to boid them at 80 Celsius degrees for several minutes with observing them. When we could see the color changes and some precipitations appeared in the solutions, we took those samples out and would use the UV monochromator to detect the intensities for the next day. For today's experiment, we used the UV monochromator to test the boiled samples. As all the intensities showed the normal results, so we assumed that this group of samples was good to test the pH values. Therefore, we used the pH meter to test the pH values so that we could decide what pH range could be suitable for the production of gold nanoparticles. However, the thing that really surprised us was that the pH values for these samples were really low and the effective production of gold nanoparticles could not be ensured in the acidic environment. Therefore, for the next time, we will add more base to the samples to compare with the absorbances of other samples. 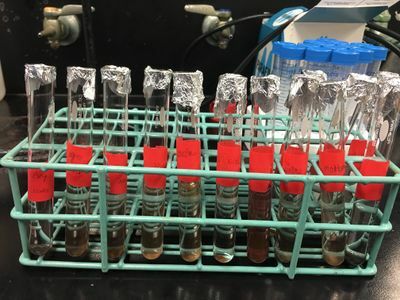 With these comparisons, we can determine if we need to add more base to the gold samples to create the appropriate basic environment before boiling them or adding the base solution the gold samples after boiling them to ensure the high production. Consequently, we still need to prepare the new samples and adjust the pH values for the next time with using the pH meter by adding more base to test tubes. We got new Tryptophan 5mg 6D, Tryptophan 5mg 7D, and Tryptophan 5mg 8D samples boiled in the water bath at 80 Celsius degrees and Tryptophan 5mg 10D sample in the oven with the settings of a heating temperature of 90 Celsius degrees and heating time for 2 hours and 15 minutes. As we remade all the samples, so we will measure the pH values for all of them and adjust them to pH values higher than 7. However, for Tryptophan 5mg 10D NaOH sample, most the liquid became evaporated because it was taken by someone on the weekend. Therefore, we followed the previous steps and made the new one. After adding 40 drops NaOH, pH changes from acidic range to basic range. After adding 60 drops NaOH, pH changes from acidic range to basic range. After adding 80 drops NaOH, pH changes from acidic range to basic range. After adding 106 drops NaOH, pH changes from acidic range to basic range. We tried to keep all the samples' pH values around 10 and the interesting thing is that the samples with more drops of NaOH needed much more NaOH drops to increase to the value around 10. Additionally, Tryptophan 5mg 6D and 8D samples became faded after adding NaOH. 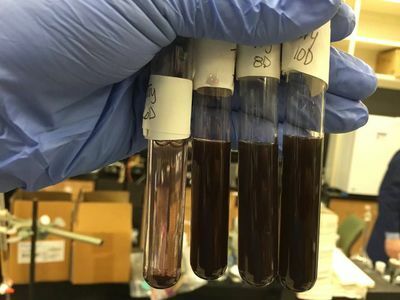 Therefore, we assumed that these two samples' gold nanoparticles became the fibers and the extreme basic environment might make these nanoparticles crashed out. Actually, in the process of measuring the pH values and titration, the pH meter's measurement didn't change. Therefore, we recalibrate the pH meter to do the measurement for one more time to make sure that the measurement is precise. However, the error caused by the equipment might lead to problems in many ways. After measuring the pH values, we used UV monochromator to measure the intensities of samples and the results showed very low absorbances of Tryptophan 5mg 6mg and 8D samples. For this time, Tryptophan 5mg 10D sample showed the normal and high peak at 580nm. As there were two samples faded, so we made new samples in this experiment and used the water bath to heat all the samples except Tryptophan 5mg 10D, which was put in the oven with the settings, 90 Celcius degrees and 2 hours and 15 minutes. After adding 70 drops NaOH, pH changes from acidic range to basic range. After adding 76 drops NaOH, pH changes from acidic range to basic range. After adding 62 drops NaOH, pH changes from acidic range to basic range. After measuring the pH values, we used UV monochromator to measure the intensities of samples as the last experiment. 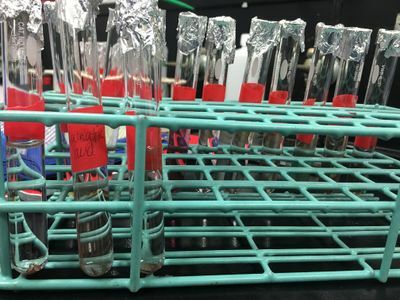 Before adjusting the pH values of four samples around 8, the color change appeared in the tubes and color change is light pink. Besides, we used the water bath to boil these samples and Tryptophan 2 sample turned dark purple. At the beginning of the experiment, we used the UV monochromator to test the absorbances of these four samples and diluted them with five to one ratio. The results are shown in the image below. From these results, Tryptophan Sample 3 showed the highest intensity. 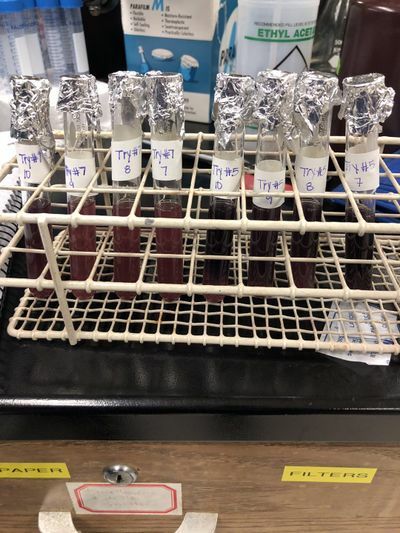 Although the masses of HAuCl4 and Tryptophan for each sample were almost the same, the volume of base 1M NaOH added to the test tubes to adjust pH values around 8 and the intensities that are shown in the graph were all different. Consequently, we thought the little difference of masses of HAuCl4 and Tryptophan could cause the great difference eventually. Besides, from the last experiment, we needed to add the extremely different number of drops to the tubes to adjust the pH around 9. Therefore, we assumed that the base added, 6 - 10 drops, before boiling and adjusting solutions' pH indeed had great effects on the adjustment of pH after boiling the solutions. Therefore, for the next time, we will add 6 - 8 drops to the solutions and wait for a while. After that, we will add NaOH to change pH with the detection of the pH meter and record the number of drops for having the pH values adjusted at 8 precisely. After finishing all the detections and adjustments, we went the P floor and cut the electrodes to do the preparation for the next week's SEC test. 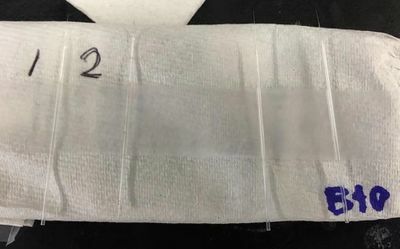 We put four electrodes with a length about 1cm of carbon fiber in each Tryptophan sample so that we can have enough carbon fiber coated with the gold nanoparticles to observe. As Sample 3 showed the highest absorbance, so we had one electrode placed in the bottle of Sample 3 for 24 hours as we assumed that 24 hours would be enough for such high concentrated sample. Additionally, Sample 4 was set as Sample 3 for 24 hours and Sample 1 & 2 were set for 48 hours. For today's experiment, we prepared four samples with the same amounts of substances that we used in the last experiment. The samples that we made were 6D, 7D, 8D, and 10D and the reason that we wanted to test these samples for one more time is that we noticed that volumes of base solutions needed to adjust the pH values around 8 for the samples from the previous experiments were different. Therefore, we planned to do the measurements and the adjustments of pH of these samples to make sure what might be the factors that caused the different volumes of base solutions required. 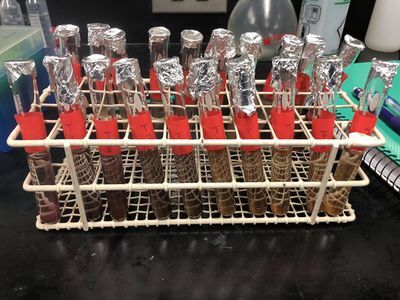 Besides, after adding 6D, 7D, 8D, and 10D of base solutions to the test tubes, we did not boil them for this time because we wanted to observe the differences between these samples and the last experiment's samples. Consequently, we adjusted the pH values of new samples before we put them in the water bath to boil. 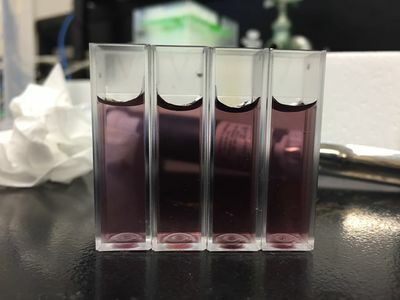 For these four samples, after adding HAuCl4 and Tryptophan to the test tubes, the color changed from transparent to pink and then purple gradually. After adjusting the pH values, we put them in the water bath to get them boiled and all the samples became dark purple. When adjusting the samples, we aspirated carbon fibers into capillaries to have them cut tomorrow so that we can immerse them in the newly made samples to test the gold nanoparticles. For the next time, we will make more electrodes and test the intensities of samples with the UV monochromator. As we noticed that all the samples were very dark, so we will dilute them with five to one ratio to test them. 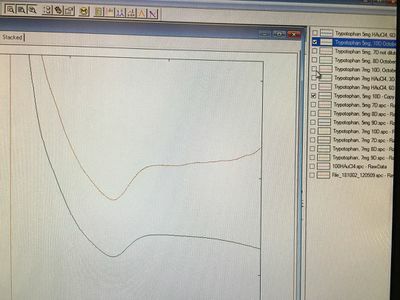 With the comparisons on the graph, we got the conclusion that Tryptophan 6D sample, which was adjusted to 8.76, showed the relatively highest absorbance. 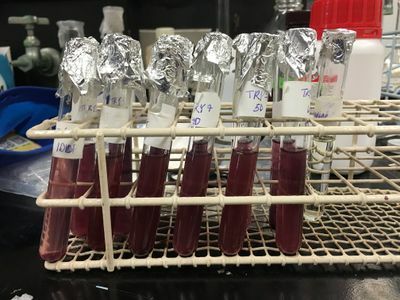 Therefore, we assumed that the pH environment around 8.76 could be suitable for Tryptophan 6D samples to produce gold nanoparticles or even the other samples. The order from high to low absorbances is 6D (pH = 8.76) > 7D (pH = 8.81) > 10D (pH = 8.22) > 8D (pH = 8.51). For the next time, I wanted to make more samples and adjusted them to the specific pH value, 8.76, and other values that are close to this value so that we can compare the values from the other samples from the previous experiments. From this process, we can determine if there is difference existing between boiling samples before adjusting the pH and boiling samples after adjusting the pH as this might affect the intensities of samples. After testing the absorbances with the UV monochromator, we cut the electrodes and had them immersed in the solutions to test the gold nanoparticles. As we observed, only one of the electrodes that we put in the previous 1, 2, 3, and 4 samples had the carbon fiber. Therefore, we needed to put new electrodes in 1, 2, and 3 samples for one time to do the test. Additionally, we had 4 electrodes immersed in each newly made samples - 6D, 7D, 8D, and 10D and divided them into two groups - one for 24 hours and the other for 48 hours. However, we forgot to take half of the electrodes out of the samples and we took all of them out on Friday, which means that all the electrodes were immersed for 48 hours. When we took the electrodes out, we found out that there were two electrodes had some gold solutions got in. As the top parts of the electrodes were not sealed, so these electrodes coated with the gold nanoparticles could only be used for SEM. Nonetheless, these electrodes cannot be used for testing the dopamine. Therefore, for the following experiments, we need to learn about how to seal the top parts of the electrodes to do further testing for dopamine. For today's experiment, we used SEM imaging to observed those electrodes immersed in the gold solutions to see if there are gold nanoparticles present on the carbon fiber. As there is no gold nanoparticles present from the images, we assumed that immersing electrodes in the solutions to get nanoparticles attached to the carbon fiber is not efficient or the time spent on immersion is not enough. As we got the suggestion from Sanuja, electrodeposition can be an alternative to immersion and the time spent will be much less. The solutions used for electrodeposition are 6D, 7D, 8D, and 10D samples. As we used UV monochromator to test the intensities, 8D and 10D samples had higher absorbance than 6D and 7D samples. 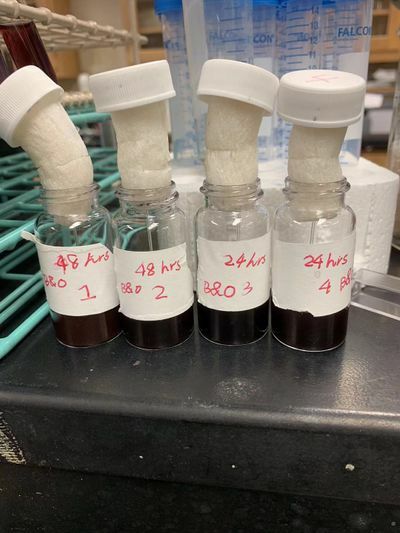 However, to achieve the successful electrodeposition, we mixed four samples to make sure that the solution is highly concentrated to get enough nanoparticles coated. With reading the article of nanotubes, the time spent for electrodeposition is about 4-5 minutes. As we talked to Sanuja, there will be too many nanoparticles coated on the carbon fiber, which makes the electrodes not suitable for the detection of dopamine, if the time spent on electrodeposition is too much. 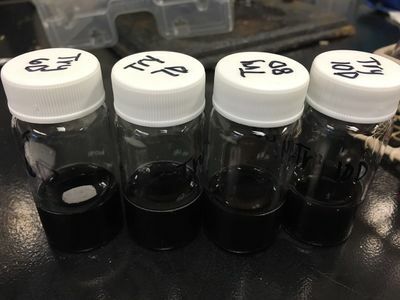 As recalled from her tested samples, she told us that 4-5 minutes would be enough and the amount of gold nanoparticles on other samples that had 10 and 20 minutes spent on electrodeposition made the carbon fiber too thick. Nonetheless, we still need to spend various time on samples to see the difference. For the first trial, 4 minutes, 5 minutes, 15 minutes and 20 minutes were spent on the depositing gold nanoparticles electronically. For this time, the SEM images did not show the presence of any nanoparticle. Therefore, there should some adjustments made to solutions to get higher concentrations. Four vials were taken and the volume of each solution increased by four times than the previous samples from 7.6mL to 38mL. Besides, the amounts of gold chloride and tryptophan used for new solution are 20mg and 4mg, which makes the ratio of concentrations of two substance 3.37:1, and the other sample's used amounts are 40mg and 4mg, which makes the ratio of concentrations 6.74. 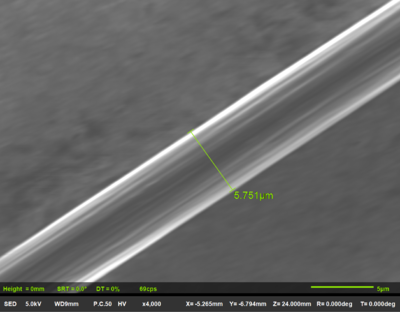 As we had the samples that were deposited electrically tested with SEM for 5 minutes, the images still showed nothing. Therefore, for this week, we focused on the electrodepositions for 10 minutes and 20 minutes to see if any developments could be made. With the newly samples, 10-minutes and 20-minute electrodeposition should have some changes for the accumulation of gold nanoparticles. With keeping the same setting for waveform number, we had the electrodes tested with SEM again to see the effects and, for this time, it turned out that the electrode that was deposition electrically for 10 minutes had a think layer of gold nanoparticles coated and the other electrodes still showed nothing. Consequently, we can assume that 3.37:1 solution can have gold nanoparticles attached to the carbon fiber more efficiently than 6.74:1 solution and a new solution that can replace 6.74:1 should be made to develop the following experiment. With the calculations of the samples, we made a new sample that had ratio of 5:1. The reason that we made this solution is that we wanted to see if the ratio between 3.37:1 and 6.74:1 can have better effects. 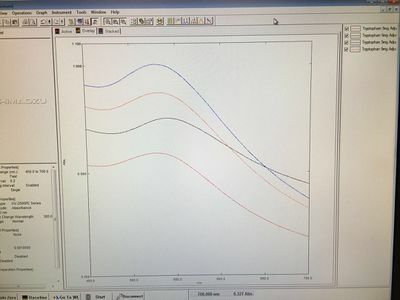 For this week, we kept 3.37:1 solution for electrodeposition and the time spent was still 10 minutes and 20 minutes as we have known that 10 minutes are enough for this solution to have gold nanoparticles attached to the carbon fiber. Consequently, we assumed that 20 minutes can have the 20-minute electrode coated with a thicker layer of gold nanoparticles to produce more optimized electrodes for the detection of dopamine. Unfortunately, all of samples failed to show the presence of nanoparticles with the tests of SEM. In the process of transferring electrodes that were processed with electrodeposition, the carbon fiber missed many times. Therefore, to prevent this problem from taking place, we needed to take the metal holder to Beeghly Building and transferred the carbon fibers to the holder. And then the holder can be taken for processing the SEM imaging. The factors that caused the failure of electrodeposition can be the expiration of solutions, time spent on electrodeposition, and the pH range. As the solutions we used for electrodeposition had been placed for a long time, the newly made solutions might achieve the goal. To have gold nanoparticles coat the carbon fiber, we need to make new solutions every time. Additionally, longer time should be spent on deposition to see if the advancements can be made. As we adjusted the pH range of solution around the value of 9, we will try to adjust the range to pH value around 8 and the value between 9 and 10. In addition to this, we are going to spend a longer time, about 25-35 minutes, on having the electrodes deposited electrically in 3:1 sample. 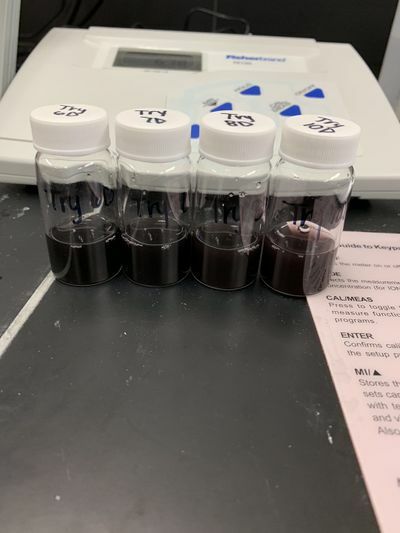 Another development that we want to make is that we want to have two groups of samples for comparison as we noticed that the pH value of solutions that was placed for some time returned to the acidic range. Consequently, for the first group, we want to keep the solutions same as the previous ones. Besides, for the second group, we will have the solutions adjusted to the basic range every time before processing the electrodeposition. For the final potential development, we will change the ratio of concentration to 4:1 and 4.884:1, which comes from 7D sample, to check if the carbon fibers can have more nanoparticles attached to them. 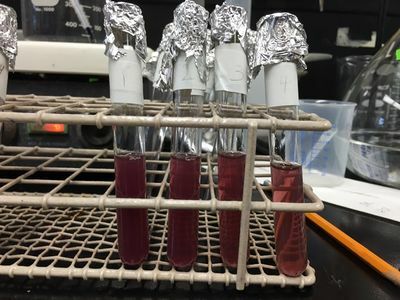 As we asked some alternatives from Dr. Zestos, Sanuja, and Pauline, we are also going to apply AuCl method and dip coating method in the future experiments to have gold nanoparticles attached to the electrodes. Besides, we are going to perform the experiments that are related to silver nanoparticles, which comes from the research project of Dr. Fox. The advantage is that there will be a shorter time spent on the reduction of silver ions, which have a positive one charge and silver nanoparticles can be used to detect the low concentration of dopamine with its low sensitivity. As we observed, Cu, Ag, and Au are in the same column and Ag and Au can be used to make nanoparticles. Therefore, we also want to make copper nanoparticles with the same procedures that we followed this semester or make some changes. This page was last edited on 8 December 2018, at 19:52.